So here we are again, a year and a half after the last relaunch, we have once again relocated and are relaunching Guin Turner.com. This is our 13th year! The reason this time is to make your experience here a more fluid one, a neater, more aesthetically pleasing experience. We hope you like the new site and that it’s worthy of the talent that is Guinevere Turner. The GT site has gone through many changes since it first launched back in 1997 (1998 solidly). Due to unforeseen circumstances the site we re-launched in 2004 needed a new home and we’ve done that this month (though it will be ongoing for weeks to come given the sheer amount of pages and information accrued on the old site). 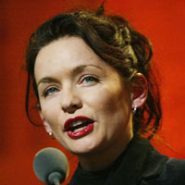 We’ve gone with a blog format for news updates as well as keeping all those other pages you’ve enjoyed over the years such as the galleries, interviews and other quirk about Guinevere Turner. Hopefully you’ll like the new layout and find it simple to navigate. We’ll enjoy it as it gives us the opportunity to update the site, something lacking for many months now thanks to what we’ll term a ‘server malfunction’. IF I SEE GUIN NEWS YOU DON’T HAVE CAN I SEND IT? We’d love to hear from you regarding news tips or other information you might have seen that we’ve miraculously missed. You can use the ‘CONTACT’ link in the main navigational area to send in your Guin Turner News Tips. WHEN & WHY WAS IT STARTED? The original site was put up in 1997 but was put up solidly mid 1998. We were the first Guin Turner appreciation site that was specifically about Guin, but we do recall another little site that appeared around the same time by the name of ‘Hootinanny’, if you’re out there lady, contact us! It was started because Tracy wanted to find out about Guin online, but there was just nothing out there, she figured she couldn’t be the only person out there wanting to know about Guin Turner, so the site was born and the rest is history! We’re hoping to bring you as much info on Guin as we can, in the neatest possible format. We’ve also got a few little treats up our sleeve that you wont find ANYWHERE else, these are going to be specific to GuinTurner.com as made by us, for you. CAN I SEND IN MY IDEAS? You certainly can. If something about the site bugs you, let us know. If you love something about the site and you want to see more, let us know. We also accept submissions and will always attribute it to YOU. We should always keep a little air of mystery, but in short we’re peace loving technology geeks who have a penchant for Home Cinema, Gaming and of course Guinevere Turner. THERE’S A QUESTION I THINK SHOULD BE ON THE F.A.Q – CAN I ADD IT? Yup! If you think we’ve missed something a lot of people wonder about, let us know and we’ll add it for you. *Note – "What is the meaning of Life" is non applicable however ;o) the Question must be site related. CAN YOU CONTACT GUIN FOR ME? All we can do is forward your messages. We don’t hang out with Guin, we don’t have regular contact with her and no, we’re not really her and this is all some big ruse. We are but doting ‘fans’ <-- ugh hate that word.